AZCO buys used test equipment. We Buy Agilent equipment including: Signal Generators, Function / Arbitrary Waveform Generators, Pulse Pattern Generators, Data Generators, Data Analyzers, DC Power Supplies, DC Electronic Loads, AC Power Sources, AC Power Analyzer, Oscilloscopes, Signal Analyzers, Spectrum Analyzers, Network Analyzers, Logic Analyzers, Protocol Analyzers, Digital Multimeters, Voltmeters, Power Meters, Power Sensors, Frequency Counters, Digital Converters, Resistance Meters, Impedance Analyzers, Dynamic Signal Analyzers, and more.. Submit Agilent equipment for a quote. Agilent / HP 8720C Network Analyzer, Calibrated w/CERT,, ! Agilent HP 8722D 50 MHz - 40 GHz Network Analyzer w/ Opts 010 012 1D5 400 FRESH Z540 CALIBRATION INCLUDED! LOADED UNIT! NEW Agilent HP E5062A 3GHz Network Analyzer with Options 16 and 175! NEW IN BOX WITH 3 YEAR RETURN TO AGILENT WARRANTY! HP/Agilent 8719D/085 Vector Network Analyzer - 50 MHz to 13.5 GHz, High Power Fresh NIST calibration, 90-day war., 2 years free cal. Agilent / HP N9923A 6 GHz Handheld RF Vector Network Analyzer - CALIBRATED! Agilent HP 4396B Network Analyzer w/Opt 1D6,101. Great Condition! 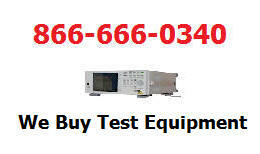 HP / Agilent 8757D 110GHz Scalar Network Analyzer Unit Tested and Guaranteed Functional with ! Agilent/HP 8713C -100 Network Analyzer, 300 kHz to 3 GH " Working & Calibrated". Agilent / HP 8753C Network Analyzer, Fresh Cal/CERT, !!! HP/Agilent 8752C Network Analyzer, 300 kHz to 1.3 GHz " Working & Calibrated". HP - AGILENT 3577B 200 MHz/ 3 CH NETWORK ANALYZER W/OPT 002 ! HP AGILENT 8753ES NETWORK ANALYZER. 3GHz. Option 011. HP - AGILENT 8702B 3 GHz LIGHTWAVE / NETWORK ANALYZER! HP - AGILENT 8753C ! HP - AGILENT 3577A NETWORK ANALYZER W/35677A TEST SET & EXTRAS! Agilent / HP E5100A 10kHz - 300MHz Network Analyzer with Opt. 002 - CALIBRATED! CALIBRATED WITH CERTIFICATE! OPT 002 INSTALLED.